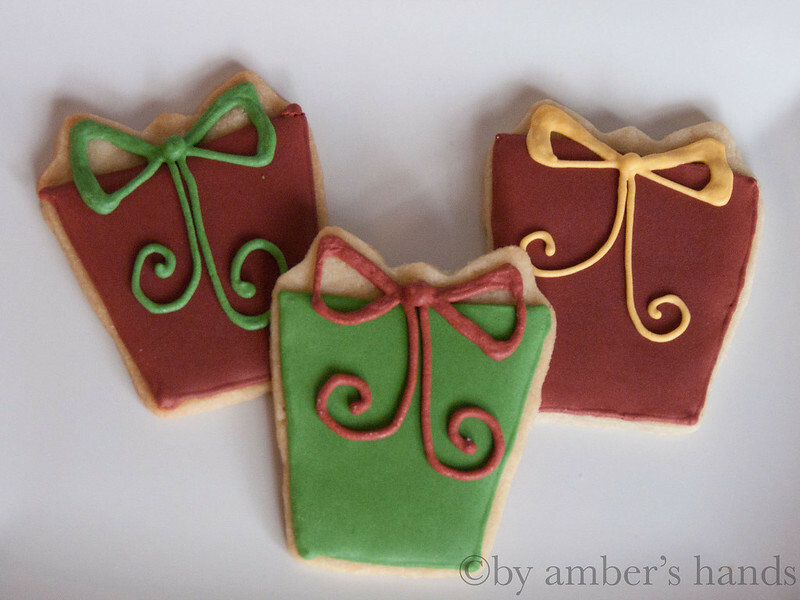 So here are a bunch of pretty cookies. Sorry, no tutorials, but the techniques aren’t really any different than other ones I’ve shown you. They’re not drastically different than last year’s. We were running out of creativity. 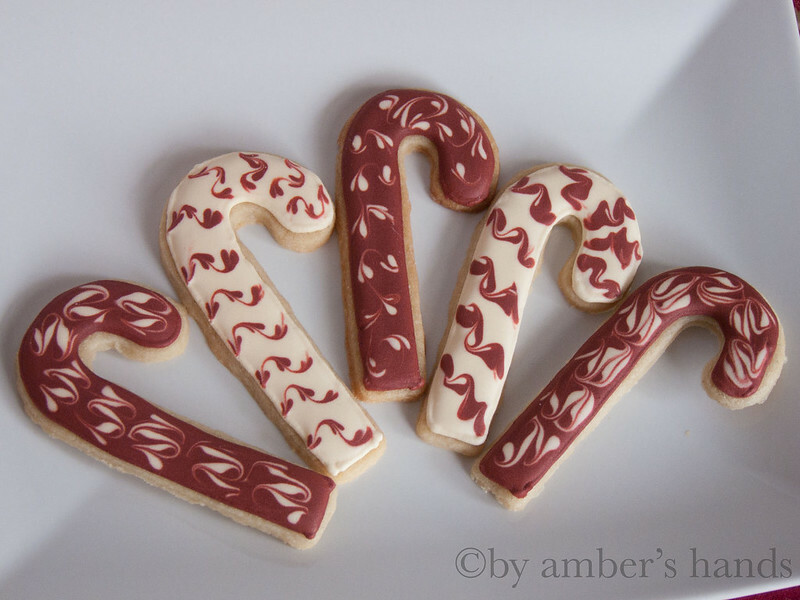 First off, we used a recipe from Smitten Kitchen for Nutmeg Maple Butter cookies. Seriously, they’re so good. I’d eat them on their own all season long. 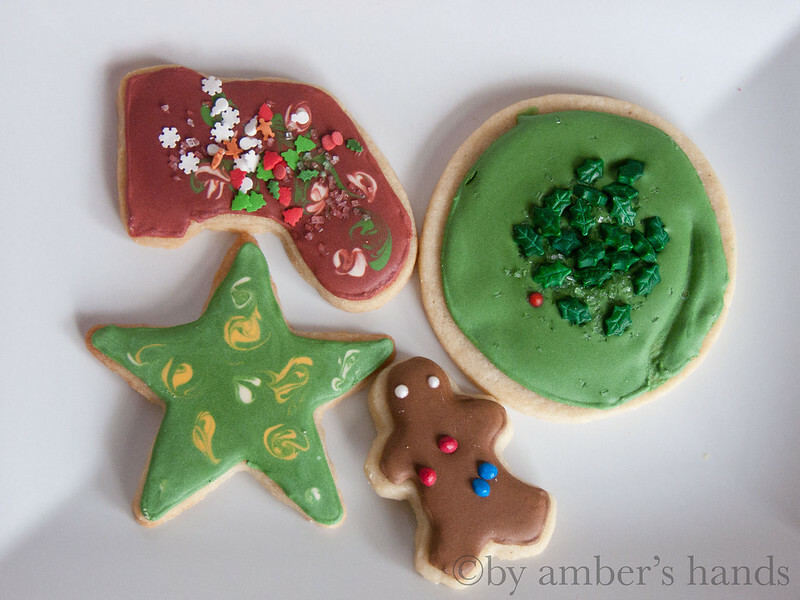 Just a tip if you’re making decorated cookies– don’t roll them too thick. They need to be 1/4- 1/8″ thick or they’ll spread and get all weird-shaped. Christmas trees! 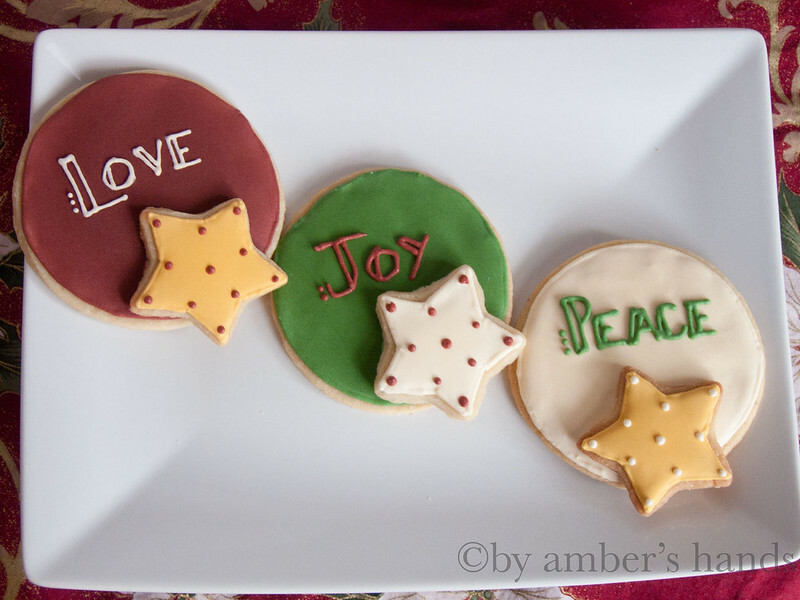 One difference this year is that we’ve tried the layered cookies. I put these on after baking, but some other bakers put theirs on before baking. Presents. These are new this year. 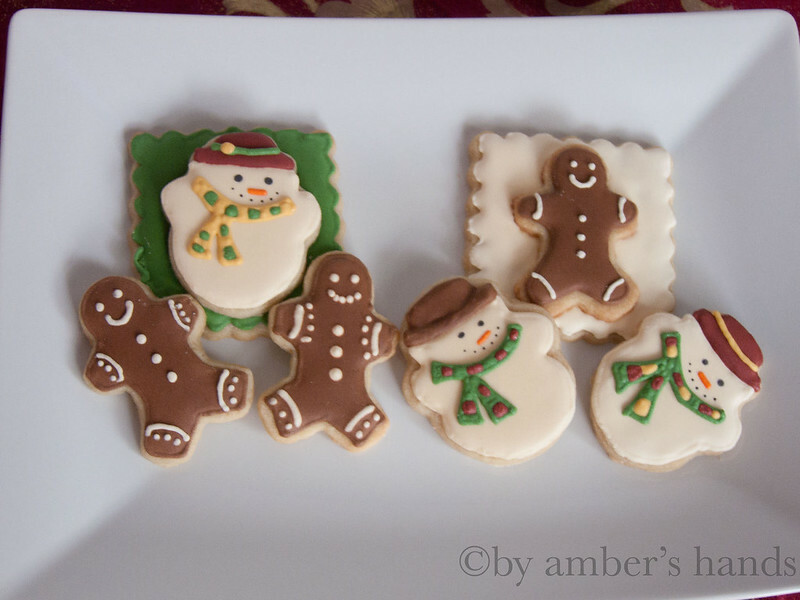 Still not really sure the best way to decorate them. 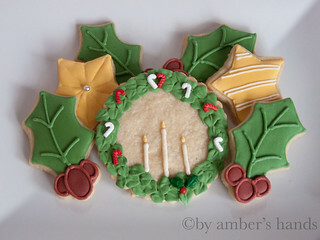 The wreaths are also new this year, though they’re just done on a plain round cookie. 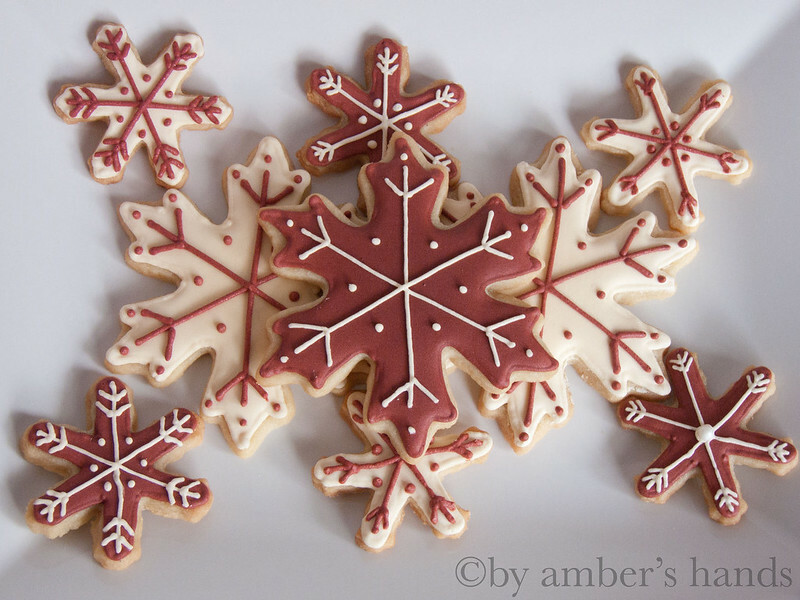 Stiff icing with a leaf tip to make the overall shape. Oh, these guys are new, too. Snowflakes. Basically the same as last year, only with a darker, more maroony red. The ever-traditional Love, Joy, Peace. 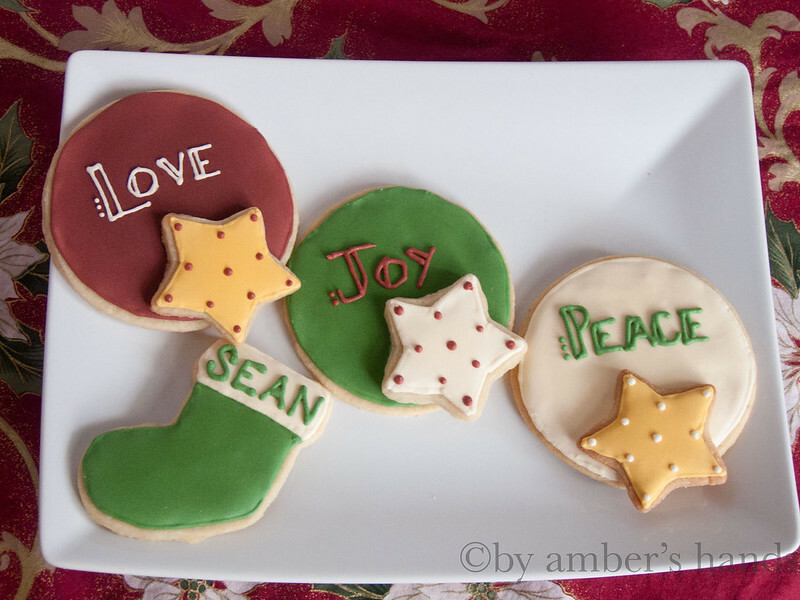 Or, as I prefer, Love, Joy, Peace, Sean. Sorry, I don’t know why that cracks me up. Little Man was SO excited to decorate cookies this year, which was nicer than last year when he mostly didn’t want me doing it at all. He did the star first, which is pretty impressive if you realize he’s only 2. I helped him a bit, but he made all the swirls himself. He was very deliberate and concentrated very hard, with his little tongue stuck out to the side as he worked. 🙂 The “ginga-bread boy” was next. Then he became smitten with sprinkles, as you can tell on the stocking. The round green one was last and makes me laugh. I love the 500 holly leaves with one single berry. And the finger-swipe on the side so he’d have an excuse to eat some frosting. Really hoping to have a couple more Christmas posts this week, but, well… it’s the week before Christmas. So, madness.